A new dining room set for my wife! #34: Getting ready to veneer! I now have my design worked out and my veneers all picked out. I have decided to simplify the design that I was first thinking about. It was just a little too complex to do on something this big. At least for me, since this is the first time doing something this big. Here you can see the plan (kind of anyway). 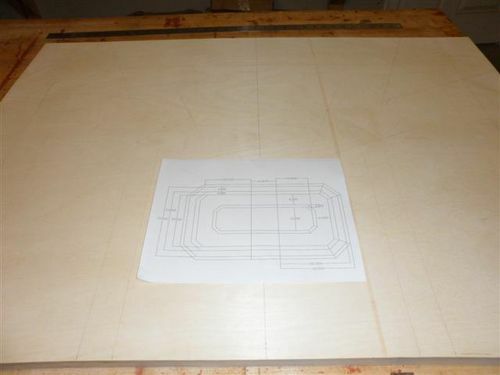 The table is basically a large rectangle with the corners cut at 45 degrees. The plan shows it with on leaf in the middle. Cutting the corners does two things. First it matches the backs of the chairs which I planned all along and secondly it saves people from banging into the corners and it is also easier to walk around. It’s kind of hard to see here but it’s one end of the table drawn in full scale. This will help me cutting some of the angled pieces. I have extended the lines for them all the way across the sheet so that I can lay my straight edge on them to cut the veneer, rather than actually measuring. 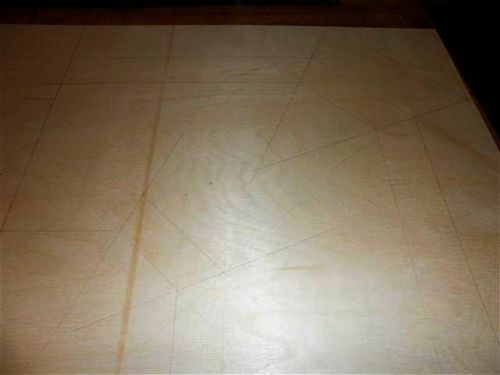 Here is my choice of material for the main field of the table. It’s Mottled Makore. I got this about 4-5 years ago and it been begging to use it. The real reason is that it’s dark enough all by itself that I won’t have to color it at all to match the mahogany legs and other parts. Here is the curly maple I will be using for the details. This is the main reason I don’t want to color the wood. I would never be able to keep it off of the maple. Next time I will be cutting veneer. I’m really starting to see the end of this project! That makore veneer looks great. This exciting Gary. 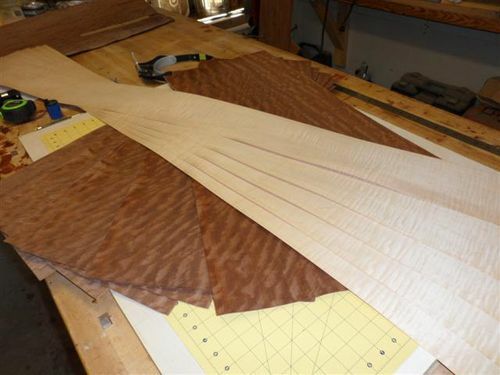 I have read tons of material on veneering have not done any yet. Your blog is like being in the classroom. The aging of the veneer had already proven the fact that it would last forever in the hands of a good craftsman. Keep it up and this time, I will learn a new lesson…. veneering. I like also your design.. looks like a geometrical… prismatic… octagonal… whatever I could imagine… you are the expert on this field. Thanks. Gary: Great looking Veneer. Nice selection. Great Job Gary, I have been paying attention from the beginning, I loved the chairs, they came out wonderfully. 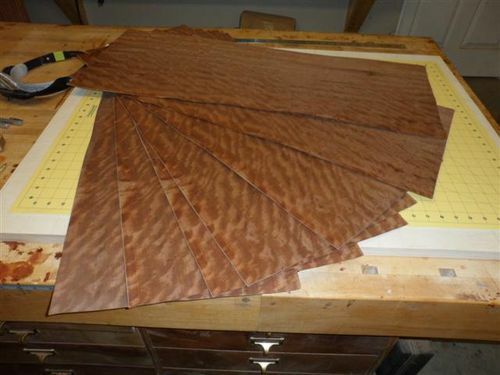 I have never done any veneering, cant wait to see the whole thing. I like the veneer choice, Gary. It will be stunning. That’s some nice Makore. One of my favorites, for sure. And as you mentioned, it works great with Mahogany. I’ve used it with Maple, too and the colors work great.